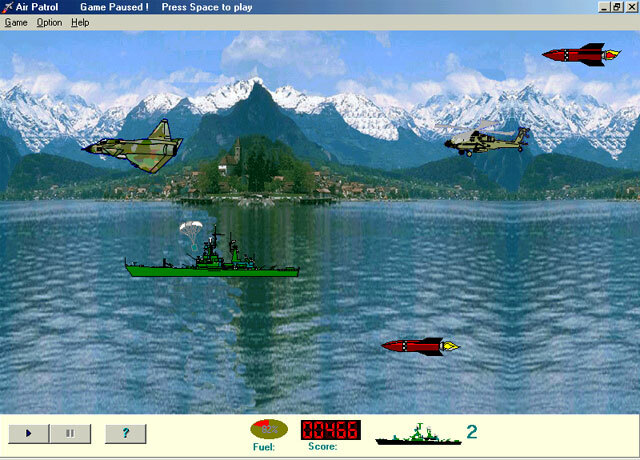 The site has utility programs and the games by SoftDarek for Windows 9x, Me, Xp, 2000, Vista in English language version. You can download and use them freely. Webmasters: Please link to this page, not the files directly. Thank you! Once there lived in a park a nice bear called Yogi. Just like other bears in this big park, Yogi never bought food in supermarkets but he ate the remnants of food left by people who often came to the park for picnics. And then one day, Yogi received a letter from his old friend. The friend wrote him that nourishment can be found not only in parks but also in people’s pantries. People keep lots of delightful food in their pantries. Yogi was really scared of people but his hunger was stronger than his fear. And so he decided to make a trip to a man's house and to take what bears like best. However, the trip there was not nice or easy because, first of all, people always lock their houses. Also, they keep various different equipment, which might be pretty dangerous to small bears. Yet the worst are those little creatures that often live in people's pantries - the mice. Bears just can't stand them, everybody knows that. Thus, it seems quite impossible to get into a pantry but there are no impossible things for such clever bear as Yogi. To fulfill his hunger Yogi must get at least 3 jars of honey from the pantry. Download the zip file, unzip to the same directory onto your hard drive. Create shortcut on Start Menu or the desktop. Start the program clicking shortcut or Yogi.exe file. Just imagine that you are a blue bird and you eat worms only. If you want to survive you must catch 18 worms. However, it’s not easy as not all worms are edible and some worms can bite. In order to survive you must also beware of tigers. It all sounds very scary and you are only a small bird but fortunately you have your secret weapon (flying guano). If you use it correctly, it surely will help you to succeed. But you will find that there is one strange thing, which is very dangerous to you and it is resistant to your secret weapon. So good luck! Download the zip file, unzip it onto the same directory. Create shortcut on Start Menu or the desktop by clicking right mouse button into "Bbird.exe" file. You must collect all stars on the sky, before line time is over. Use the keyboard arrows for move your spacecraft and catch stars to sack. When two sacks are full of stars, you win and hear congratulations. 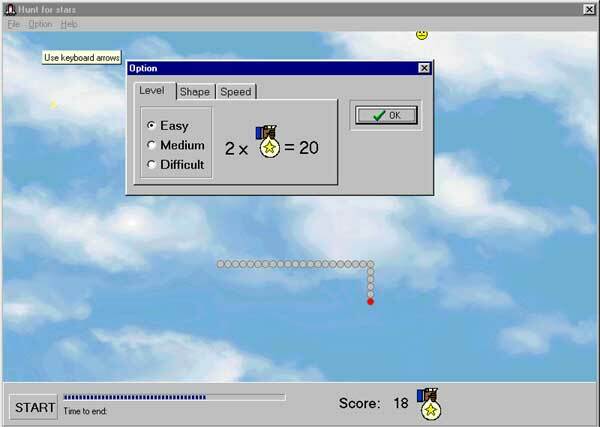 In option menu you can choice: difficult level, speed, shape of stars and your spacecraft. If you catch "smiling face" your time increase. Click "Start" button to begin new game. Download the zip file holding the game materials, unzip it onto your hard drive to the same directory. Create shortcut on the desktop or Start Menu by clicking right mouse button into "Hunt.exe" file. Start the game clicking "Hunt.exe" or shortcut. You are a pilot of a Jet F 16. You set off on a daily patrol. Suddenly at the territory, which you control, there appear the objects of an enemy. Without a second thought you decide that they are going to attack your country, and only you can prevent the invasion. 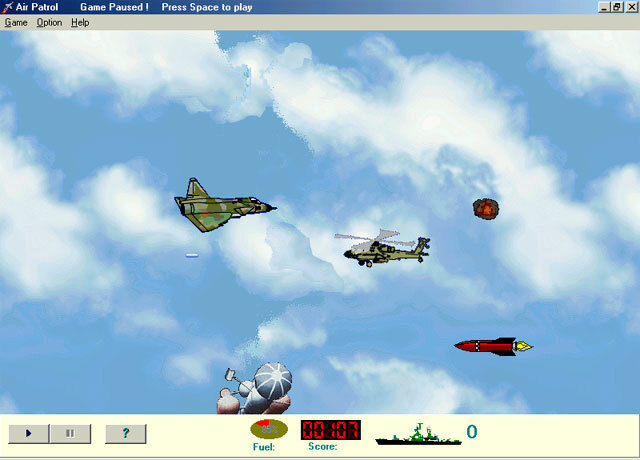 Fortunately your Jet is faster than the enemy's aircraft's, it is also equipped with better and more powerful weapons, so everything depends on the skill of the pilot. 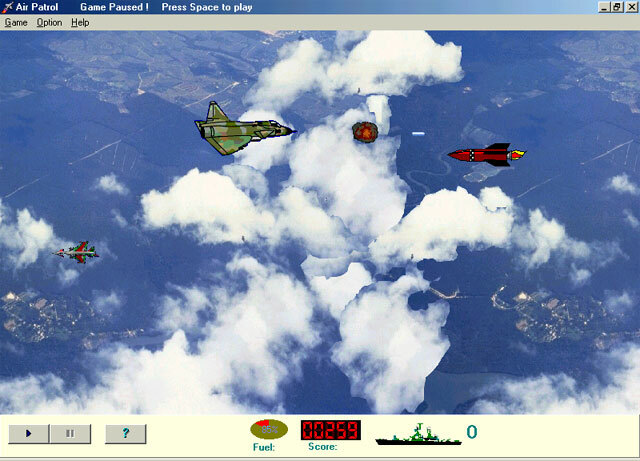 You may not allow the enemy rockets to pass through the sky section, which you control. If just 5 of them manage to pass through, your mission will end up with failure and your country would be destroyed. Create shortcut on the desktop or Start Menu by clicking right mouse button into "Patrol.exe" file. Start the game clicking "Patrol.exe" or shortcut. Program is a collection of tests that can be used to check CRT or LCD monitor performance. The program will test important criteria like sharpness, convergence or the geometry. resolution, moiré, brightness, contrast, readability, screen regulation and color. Additionally, there are a number of test images that can help you to judge the image quality of a monitor. Monitor Tester doesn´t require an installation, it is completely freeware. Download the zip file holding the program, unzip it onto your hard drive to the same directory. Create shortcut on the desktop or Start Menu by clicking right mouse button into "Moniteste.exe" file. Start the program clicking "Moniteste.exe" or shortcut.